Camps and project accommodations provide a buffer for the Regional Municipality of Wood Buffalo (RMWB) and reduce social strains from population swings that inevitably happen in a resource-based economy. In the early 2000s, stronger oil prices resulted in a change in the economics of oil sands development. Between 2000 and 2008, there was a substantial population growth in the Regional Municipality of Wood Buffalo (RMWB) almost doubling the population base. In 2005 and 2006, the RMWB identified housing as the most significant challenge and that rapid population increase was straining local infrastructure and service levels. In the following years, the RMWB recognized that work camps were an important tool to address chronic housing shortages in the region. Industry has invested hundreds of millions of dollars in infrastructure to support a rotational workforce, justified by years of planned future operational use. Open Camps: house variety of projects, mainly used for construction, drilling, scheduled turnaround and maintenance. Private Camps: house workers for a specific project, related to a specific company or project and tend to be operational in nature (on a regular rotational schedule). 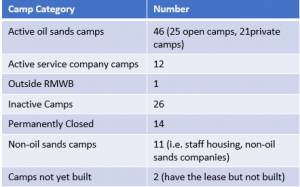 Oil sands camps provide annual tax revenue to RMWB of over $16 million. Procurement spend for camps and catering services with local Indigenous businesses was $335 million in 2015-2016. Many of the camps exist to meet the temporary and short-term housing needs of workers in the region. 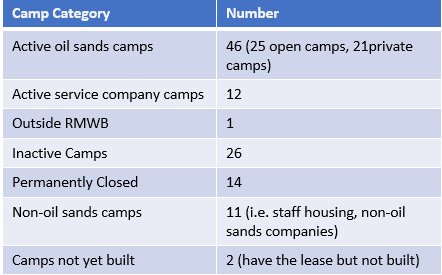 During different times of the year, there can be significant variation in the camp occupancy, depending on general economic conditions and the specific activities (e.g. turnarounds, maintenance, etc.) taking place at specific projects. In the past, occupancy rates peaked during winter months as winter drilling activities drew workers to the region. However, in the current economic climate, workforce peaks are driven mostly by turnaround activity and, accordingly, occur in the spring. During these peak times, occupancy can range from 15,000 to 34,000. Oil sands turnaround maintenance is the scheduled shutdown of oil sands processing units or plants for overhaul and repairs. Turnarounds typically occur in the spring and the fall to take advantage of warmer weather and limit interference with the in situ drilling season. As a result, the workforce for turnaround maintenance required on site is large but for a relatively short period of time. 2018 was a big turnaround year for several companies and the approximate turnaround population was 14,000. The RMWB conducts a Census every three years to obtain an accurate and reliable count of the region’s population and housing stock. The census is typically conducted in the spring (April – July). The total population of the Municipality decreased by 11% from 2015. This can be attributed to the wildfire in 2016 as well as the economic downturn. The total shadow population and project accommodation occupancy decreased by 15% from 2015. If we took into account the turnaround population for 2018, the decrease would be greater.